How much does two inches matter? 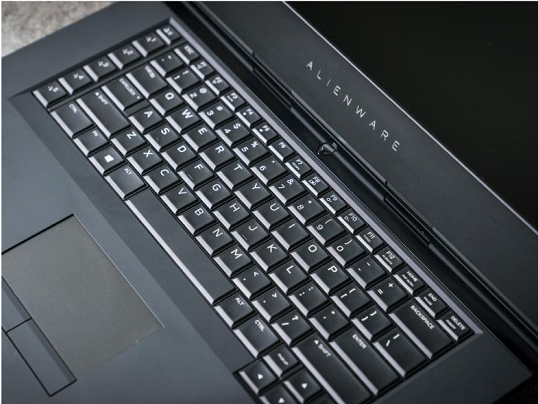 You wouldn’t think it would be a huge factor, but when I reviewed the Alienware 17. I called it “staggeringly huge” and said it was “time to hit the gym” if you wanted to carry one around. Since then, I’ve spent a few weeks using the Alienware 15—a laptop with the potential to be just as powerful, but in a slightly lighter package. And it turns out that’s good enough. Fits into a normal size backpack-sort-of. 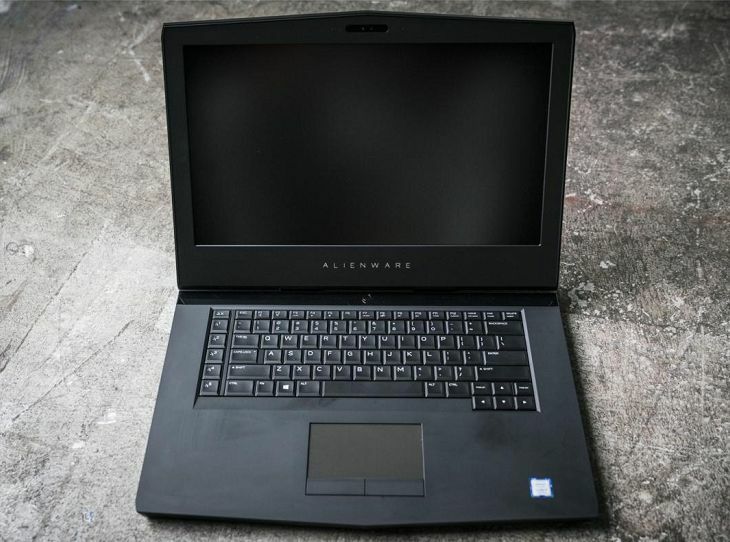 It’s still huge, still loud, and still has that enormous (and ugly) hinge on the back, but the Alienware 15 is much more manageable and roadworthy than its 17-inch sibling. This is the size to get. Don’t get me wrong: The Alienware 15 is still a massive laptop, especially if you put it up against competing 15-inchers. This isn’t a Razer Blade-style device, and portability suffers. Alienware could really use a lightweight line as an alternative—and maybe we’ll start seeing those soon, as the line between Alienware and Dell begins to blur. But I felt like the Alienware 17 was completely unmanageable. It was a set-it-and- forget-it laptop, one you plop on the desk and then never move. With the Alienware 15 you might want to bulk up your back muscles, but carrying it is definitely doable. How do I know? I gave the Alienware 15 the full backpacker treatment, using it as my main machine for three weeks or so while I was on vacation and hauling it between hotel rooms, packing and unpacking it from my bag, putting it in the bin for airport security screening, and even reviewing games on it in the late-night hours. So yeah, I wouldn’t call it easy per se, but it was certainly doable. When I brought the Alienware 17 on the road (for a much shorter trip, I might add) I struggled daily. The Alienware 15 was a welcome companion, powerful enough to game on by night without throwing out my back by day. Would I accept slightly worse performance for a thinner laptop? Absolutely. For those who need true desktop power on the road, two inches can make one hell of a difference, though. And that’s really the only difference. 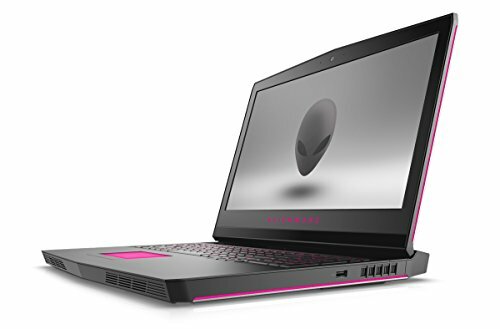 The Alienware 15 measures 15.3 x 12 inches, is an inch thick when closed, and weighs in at 7.6 pounds (compared to 9.6 for the Alienware 17). The power adapter is also smaller, measuring probably half the thickness and weighing 1.8 pounds instead of 2.5 for the Alienware 17’s brick. 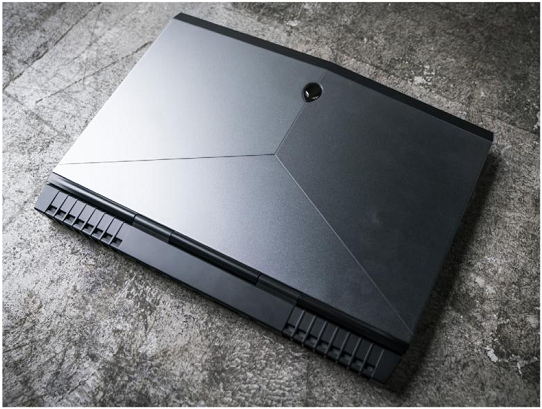 The Alienware 15 measures 15.3 x 12 inches, is an inch thick when closed, and weighs in at 7.6 pounds (compared to 9.6 for the Alienware 17). brightness and viewing angles are a bit narrow-same as the 17, though it’s mercifully less noticeable on the 15’s smaller screen. The whole thing is encased in a chrome and black chassis, emblazoned with the Alienware logo on the outside and the sleek typelogo under the display. Alienware’s lighting is just as impressive and over-the-top on the 15, with RGB light channels running down each side of the display, on the lid, and even underneath the trackpad. That last has grown on me during my time with first the 17 and now the 15, and I’ve come to find it almost as useful as keyboard backlighting at night. My biggest complaint with the 15 is the same as with the 17: The hinge. Rather than joining at the rear, the monitor is instead set forward about an inch. That leaves a hunk of plastic sticking out behind the monitor, which is where most of the fans vent. The Alienware 15’s hinge is proportionately smaller than the 17’s, but it’s still an eyesore. It’s also just annoying, especially on a plane or in similarly tight quarters where the hinge takes up much-needed desk space. The hinge hassle is compounded by the fact that the laptop’s ports are almost all located in the rear: Power, HDMI out, ethernet, USB-C, and Alienware’s proprietary Graphics Amplifier port. Not only is it hard to plug in the laptop in when you can’t see the port, its rear location also further limits how close you can set the Alienware 15 to a wall, because the cable sticks out at least another two inches. The Alienware 15’s hinge is proportionately smaller than the 17’s, but it’s still an eyesore. user-friendly design, though, and it doesn’t take portability into account at all underscoring the reality that these are more “Desktop Replacements” than laptops. The benefits: It’s sturdy, for one. Also, you can lay the display completely 180-degrees flat, though I can’t imagine a situation when you’d want or need to do so. Unfortunately, having the fans vent behind the screen doesn’t cut down on noise as much as I expected. I thought that might be one reason for the design, but like its larger sibling, the Alienware 15’s fans are distractingly loud at full load, whether hidden behind the display or not. Those looking for portable desktop power are well served by the Alienware 15. Not only is it a more portable device than its 17-inch peer, it can pack just as much power inside. The Alienware 17 we looked at was outfitted with an Intel Core i7-7820HK and an Nvidia GeForce GTX 1080. 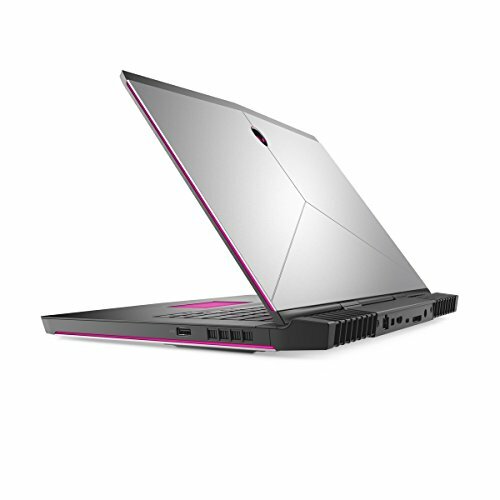 With deep pockets you can put the same configuration into the Alienware 15. Our Alienware 15 was one step down, both in price and power, with an Intel Core i7-7700HQ, a GTX 1070, and 16 GB of DDR4 RAM. Storage took the form of a 512GB SSD and a 1TB hard drive. Not too shabby. As I said, I did multiple game reviews on the Alienware 15 and it ran without a hitch, usually on a mix of High and Very High settings. 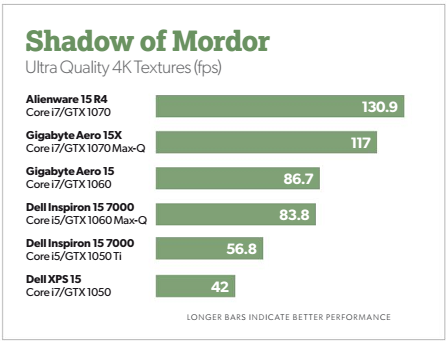 Digging into our tried- and-true benchmarks, you can see that the Alienware 15 managed 93.9 frames per second in Rise of the Tomb Raider at 1920×1080 on Very High, and 130.9 frames per second in Middle Earth: Shadow of Mordor at 1920×1080 on Ultra with the 4K texture pack installed. 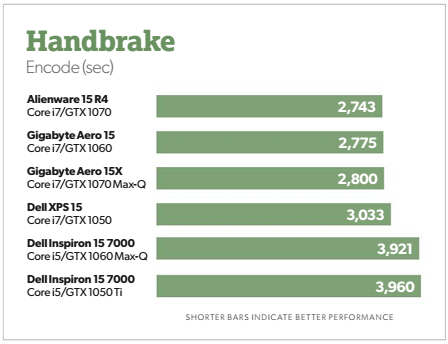 That compares favorably with other 1070-equipped laptops as well as slower 1060 units. The HP Omen 17, for instance, scored 95.5 and 118.9 respectively on the same benchmarks with an i7-6700HQ and a GTX 1070. 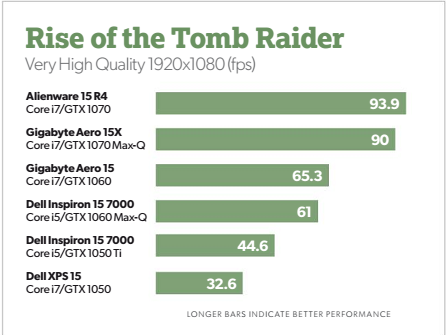 As for how it stacks up against the likes of a 1080-equipped Alienware 17, you’re looking at 102.2 and 154.9 frames per second in Tomb Raider and Shadow of Mordor— definitely a gap, though not a huge one. The Alienware 15 even stacks up favorably against 1080 Max-Q laptops, which is to be expected— our testing has generally shown a Max-Q 1080 puts out performance comparable to that of a well- vented 1070. This pattern doesn’t really show up in gaming benchmarks, mostly because gaming benchmarks tend to be only a few minutes long. Thus, the Asus ROG Zephyrus GX501 scored 104.8 in Rise of the Tomb Raider and 136.8 in Shadow of Mordor, comparable to the Alienware 17. If we jump over to 3DMark, though, where the tests tend to be longer, we see that the Alienware 15 scored a 4,097 in FireStrike Ultra. 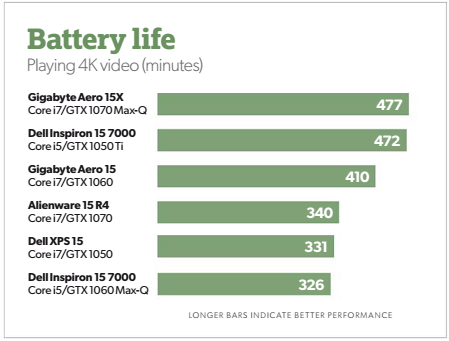 Compare that to 4,091 for the GX501 and you can see that as heat builds up, the Max-Q 1080 throttles at right around the same performance level as the Alienware 15’s better-vented GTX 1070—and the Alienware 15 is less expensive. Impressive. The HP Omen 17 scored a 3,837 and the Alienware 17 posted 4,960, for the curious. It’s a very solid laptop. The one weak point is the battery, coming in at an ever-so- average 3 hours and 45 minutes in our standard rundown test, where we set the laptop’s display to 250-260 nits in brightness and loop a 4K video until the battery goes dead. Lifespan is even worse while gaming: Expect 1.5 to 2 hours in that scenario, or even less. Hey, as I said earlier: At least the power adapter’s smaller for the 1070 model. The Alienware 15 probably wouldn’t be my first choice, but it puts out incredible, desktop- level performance. Even with a GTX 1070 the Alienware 15 handled everything I threw at it with aplomb, and did it while still fitting inside a normal-size backpack. Barely fitting, but come on—I’m trying to be charitable here.